Senate President Bukola Saraki at the World Press Conference in the National Assembly. The Senate President, Dr. Bukola Saraki has, Wednesday, held a press conference where he condemned Tuesday's invasion of the National Assembly by armed operatives of the Department of State Services, DSS. The conference which also has the Speaker of the House of Representatives, Hon. 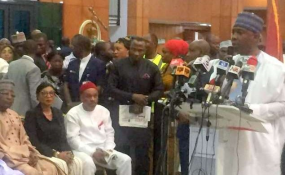 Yakubu Dogara and many other Senators and members of the House of representatives, as well as many other distinguished guests in attendance, saw the Senate President narrate how the DSS operatives blocked NASS from carrying out its constituted duties. According to Saraki, ""It is a matter of record that yesterday, lawmakers and staff of the National Assembly were prevented from entering the @nassnigeria Complex by heavily armed security agents of the Department of State Services (DSS). All entries to the Complex were blocked." "The National Assembly, the seat of democracy in Nigeria, was under lockdown. Senators and Members of the House of Representatives were prevented from gaining access." "The ensuing standoff was a show of shame that played itself out over several hours in full view of the country. In no circumstances should this have happened. And we as a nation reaped the bitter fruits instantaneously as evident in media images relayed around the world, images that shame us as a democratic nation. The siege was also an act of cowardice by those seeking to carry out an illegal impeachment of the leadership of the Senate in flagrant disregard of the law." "People who seek control at all costs, by whatever means, never minding the injury to democratic norms. I have to say that this is not about me – Abubakar Bukola Saraki as an individual. It is not about Ike Ekweremadu, nor is it about Yakubu Dogara."